First, it’s important to note that insects are poikolitherms, or cold-blooded, animals. This means they are dependent on their environment when it comes to their development and metabolism. After the mating process, cricket females lay their eggs in humid soil using their ovipositor. It can then be covered with bran in order to avoid desiccation and minimize cannibalism. It is important that the soil stays humid, but not damp, and that it has no pesticides or harmful chemicals, as insects are obviously vulnerable to those substances. The incubation takes 10 to 13 days. One of the characteristics of crickets is that they do not have a larval phase, and emerge resembling small adults. They then go through different instar for a period of time which varies depending on temperature and other breeding conditions. In about 45 days, the small crickets get to adult size; from that point, only their chitin shell will develop. A few rules have to be observed if you wish to start rearing these insects: Do not directly give them water, as they would probably drown in it. Instead, use a bottle of water and make a hole in it, then put a cotton cloth through it, which will get soaked from the water. You should use egg cartons, as those are the cheapest and best way to provide shelter to the crickets. The cartons which also provide 3 dimensional shelter, thus multiplying the available shelter space. Be aware that crickets have territories and might attack each other. This particularity is used in China for cricket fighting. 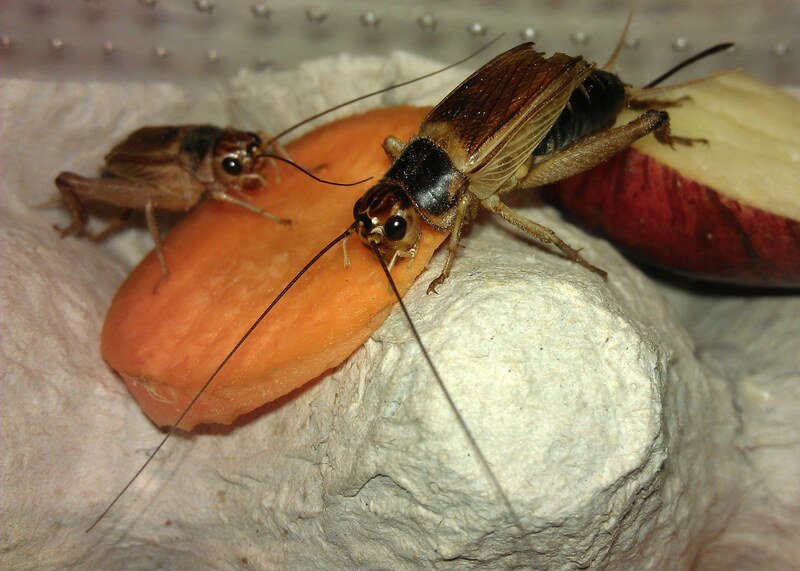 Crickets are omnivorous and will happily eat food scraps. In order to limit cannibalism, you should always try to add some protein to the diet of your insects (either animal or vegetal).